Before you begin working your way to foreign language fluency, it helps to understand the culture behind the language you’re learning. After all, language exists to help a group of people express their ideas and beliefs. Russia is a vast country with a rich history and culture. As you begin your Russian language program, gaining a strong grasp on this history, the values, and the etiquette will help you rapidly achieve success. In particular, Russians have appreciate festivals and celebrations as much as those in the Western World. Like most countries in the West, Russia has quite a few holidays that its people celebrate over the course of a year. This starts on January 1 where Russians celebrate New Year’s Day (“НовыйГод”) with the rest of the world. That is followed less than a week later by Orthodox Christmas (“Рождество”). Celebrated on January 7, this Holiday was forbidden for decades and finally made a comeback in 1992. Singing, chanting and feasts mark the day, though all of the dishes are supposed to be meatless. February 23 is marked as “ДеньзащитникаОтечества” (Day of the Defender of the Motherland day) and generally is a celebration of Russian men, 90 percent of whom have served or were supposed to serve in the Russian army. This is followed closely on March 8 with International Women’s Day, called by Russians simply as “ВосьмоеМарта” (March 8th). In Russia this is a day in which men give flowers to their wives, mothers, grandmothers, daughters, sisters – to all of the women in their life, including female colleagues, professors, etc., and all the streets are filled with flowers. There are Russian Holidays mixed in with more well known International holidays all throughout the year. 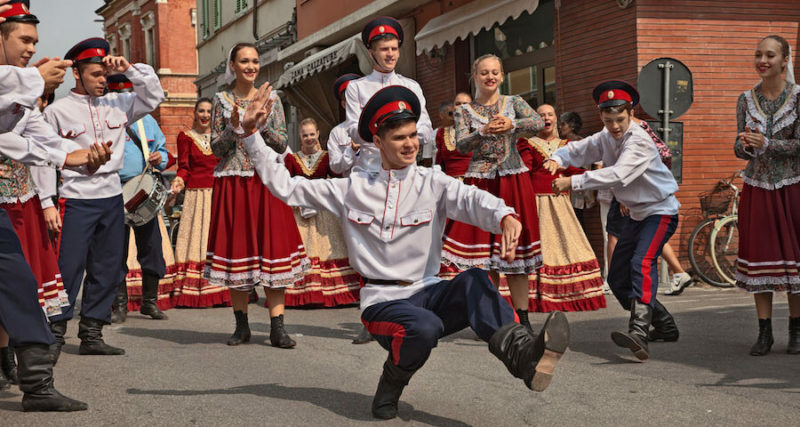 The thing that people who are either visiting or wanting to do business in the former Soviet country should know is that the culture takes each and every one of these Holidays seriously. That means you want to make sure you aren’t trying to set up a meeting, or an important work day on one of these many Holidays. Because quite a few of these days center around cherished or at least well known Russian historical events, you are going to ruffle feathers if you attempt to do something the vast majority of people in the country view as interfering with the holiday. Between the Russian gift for being gracious hosts and their many special occasions throughout the year, there always seems to be an opportunity to throw a party. While the frequency of parties in Russian culture is constant, that doesn’t mean they’re very predictable. A party may be thrown at any time for any reason and it may be hosted at any random location. Spontaneity is as valued as a good drink in Russian society. Additionally, a party isn’t interpreted the same way in Russian culture. While drinking is certain to be involved, there may also be several activities planned at multiple locations. For instance, one such party started out with a three hour soak in a “баня” (sauna), before the group went on a two hour vodka drinking binge. The event was capped off with an impromptu hockey match. That game consisted of 2 pairs of skates, 4 sticks, and no puck. As might be expected, invitations are rare. Even when they are given, they’re informal and lack much advance notice. Party invitations are generally given by phone or in person with just two to four days advance notice. Sometimes, word of a party may be given, where the celebration is scheduled for the very next day. Written invitations are rarely sent out, as they’re too formal and don’t allow for much spontaneity. To the contrary, Russian men may be even more passionate about hosting a good cookout than their American rivals. Giving them a chance to enjoy the outdoors, Russians take any opportunity to throw “нашашлыки” (barbeque). Like those held by families in the United States, Russian barbeques are informal gatherings of family, friends, and co-workers, so everyone is welcome to attend in jeans and a T-shirt. Even businessmen give up their suits and ties for the day. The barbeque actually begins the night prior to the planned cookout, when the man of the house prepares the meatfor “шашлык.” Traditionally, Russian men marinate the meat overnight in red wine, onion and a selection of spices. The barbeque gives the men an opportunity to show off their own cooking skills, so they take great pride in how the meat is prepared. Guests may be told not to bother bringing a dish to pass, but, even so, a bottle of wine will be an appreciated gesture. While Americans normally reserve the weekend barbeque for the summer months, Russians indulge all year round. Even in cases where the temperature may drop to forty degrees below zero, Russian men can be seen standing at their grills and flipping meat. While that may seem unusual to Westerners, it serves as a sign of just how important the barbeque has become to Russian families. Something Westerners might not to expect is the little known passion Russians have for offering their hospitality. In fact, they go to such great lengths that their guests may sometimes feel smothered. Guests are often showered with gifts, fed extravagant meals, and plied with drinks, so much so that they may feel forced to overindulge themselves. If your Russian host comes to visit you on another occasion, you may feel compelled to return the generosity. That’s fine, but be aware that Russians tend to interpret English phrases in a literal sense. For instance, if you invite your Russian friend to your home to do some hunting, it may be necessary to make sure he understands that you will be hunting wild game. Otherwise, he might think you intend to shoot him. In one example, an English businessman invited his Russian associate to his home. He mentioned that his property is “great for shooting.” Upon consulting his dictionary, the Russian gentleman seemingly misinterpreted his friend’s intentions.